After students reach fluency in math facts, fact families, fractions and multi-step math problems, the next steps involve order of operations. Here is a whole and complete lesson for you to use for free. This lesson uses Direct Instruction scripting to reduce frustration and confusion for the student. It also uses behavior objectives and precision teaching methods so that the student can quickly achieve fluency and mastery in the application of order of operations problems. You can deliver each task in the lesson as a separate activity, and repeat as necessary with students. A link to a downloadable pdf with all tasks and worksheets can be found at the bottom. Order of Operations can be confusing for students. It is much more effectively taught if we use a formula known as B.E.D.M.A.S. B.E.D.M.A.S. outlines the order in which the various steps in an order of operations math problem must be solved. The following script outlines the concepts in a step-by-step lesson. Say to the students, “Now I am going to teach you some rules about the order of operations. The order of operations tells you the steps you must use to solve math equations. Here is the first rule. When you solve math equations, you work the problem from left to right. Listen again. When you solve math equations, you work the problem from left to right. Say that rule with me. Ready. Signal. Students and teacher together say, “When you solve math equations, you work the problem from left to right. Say to the students, “Say that rule all by yourselves. Ready. Signal. Have the students repeat the rule until they can say it quickly and accurately. Say to the students, “New rule. My turn. Listen. When we do math problems we do each step in the correct order. Listen again. When we do math problems we do each step in the correct order. Say that rule with me. Ready.” Signal. The teacher and students say, “When we do math problems we do each of the steps in the correct order. Say to the students, “Say that rule with me again. Ready.” Signal. Repeat the rule with the students until they can say it quickly and correctly. Say to the students, “Now it is your turn to say the rule about the order of operations all by yourselves. Ready.” Signal. Have the students repeat the rule until they can say it quickly and correctly. Write on the board B.E.D.M.A.S. Point to the acronym and say to the students, “Here is an easy formula to remember the order of operations. Listen B.E.D.M.A.S. Listen again. B.E.D.M.A.S. Say that word. Ready. Signal. Say to the students, “B.E.D.M.A.S. is an acronym that tells us the order of the steps to solve a math problem. Listen again. “B.E.D.M.A.S. is an acronym that tells us the order of the steps for solving a math problem. Say to the students, “My turn to say the rule about B.E.D.M.A.S. Listen. Each letter stands for one of the steps in the problem. Listen again. Each letter stands for one of the steps in the problem. 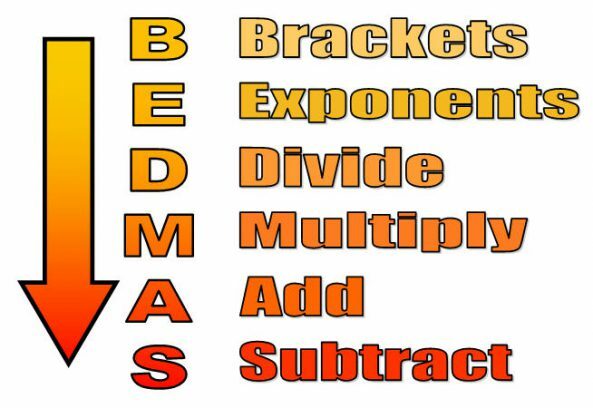 What does each letter in B.E.D.M.A.S. stand for? Ready. Signal. Say to the students, “My turn to say what the letters in B.E.D.M.A.S. stand for. Listen. B stands for Brackets. What does the B in B.E.D.M.A.S. stand for? Ready. Signal. Say to the students, “That’s correct. If there are any brackets in the problem, we have to do the brackets first. What is the first step in solving the problem? Ready. Signal. Say to the students, “Next letter. The E in B.E.D.M.A.S. stands for Exponents. What does the E in B.E.D.M.A.S. stand for? Ready? Signal. Say to the students, “That’s correct. Exponents. After we do all the brackets in the problem, we do any exponents. Listen again. After we do the brackets, then we do the exponents. What do we do first? Ready. Signal. Say to the students, “That’s correct. After the brackets, what do we do next? Ready.” Signal. Division. ‘M’ stands for Multiplication. After we do the exponents, we do the division and multiplication. What do we do after the exponents? Ready. Signal. Say to the students, “That’s right. After the brackets and the exponents we work with any division and multiplication. Now we have ‘B’, ‘E’, ‘D’ and ‘M’. Tell me what each letter stands for. ‘B’. Ready.” Signal. Say to the students, “ Good remembering. Next letter ‘E’. Ready.” Signal. Say to the students, “ Great. Next letter ‘D’. Ready.” Signal. Say to the students, “You got it. Last letter ‘M’. Ready.” Signal. Say to the students, “Right again. Now lets add the last two letters of B.E.D.M.A.S. Listen. The last two letters are ‘A’ and ‘S’. What are the last two letters of B.E.D.M.A.S.? Ready. Signal. Say to the students, “Yes. ‘A’ stands for addition. ‘S’ stands for subtraction. Listen again. ‘A’ stands for addition. ‘S’ stands for subtraction. Your turn. What does ‘A’ stand for? Ready. Signal. Say to the students, “Correct. ‘A’ stands for addition. What does ‘S’ stand for? Ready. Signal. What does the B in B.E.D.M.A.S. stand for? Ready. Signal. Say to the students, “Next letter. The E in B.E.D.M.A.S. stands for Exponents. What does the ‘E’ in B.E.D.M.A.S. stand for? Ready? Signal. Say to the students, “That’s correct. Exponents. What do we do after the exponents? Ready. Signal. Say to the students, “ Good remembering. What do the last two letters of B.E.D.M.A.S. stand for? Ready. Signal. Say to the students, “Yes. ‘Addition and Subtraction. Nice work. Now we know the order in which we will do the steps in the problem. Let’s look at some problems and see how we solve them. Say to the students, “My turn to read the problem. Listen, Five plus seven minus four equals some number. Your turn to read the problem. Ready. Signal. Say to the students, “Good reading the problem. Remember the first rule about working the problem. When we work this problem do we go from right to left or from left to right. Ready. Say to the students, “Good remembering that rule. We work the problem from left to right. Look at the acronym for B.E.D.M.A.S. What is the first thing we look for in the problem?” Ready.” Signal. Say to the students, Correct. Are there any brackets in this problem? Ready. Signal. Say to the students, “Right. There are no brackets. Look at the formula. What do we look for next? Ready. Signal. Say to the students, “That’s correct. After the brackets, we look for exponents. Are there any exponents in this problem? Ready. Signal. Say to the students, “Right again. There are no exponents in this problem. Check your formula. What do we look for next? Ready.” Signal. Say to the students, “You got that right as well. Are there any division or multiplication signs in this problem? Ready. Signal. Say to the students, “That’s right. There are no division or multiplication signs in this problem. Look at the last part of the formula. What do we look for next? Ready.” Signal. Say to the students, “Are there any addition and subtraction signs in this problem? Ready. Signal. Say to the students, “Read the problem. Ready.” Signal. Say to the students, “That’s right. What is 5 + 7? Ready.” Signal. Say to the students, “Good working that problem. Let’s look at another one. Say to the students, “Read this problem. Ready. Signal. Say to the students, “Let’s use our formula to solve this problem. What do we look for first? Ready. Signal. Say to the students, “Remember. You work the problem from the left to the right. What do you do with the 6? Ready. Signal. Say to the students, “What do we do first? Ready.” Signal. Say to the students, “Perfect. 9 x 3 is 27. What do you do next? Ready.” Signal. Say to the students, “Good remembering to work from the left to the right. What is 6 + 27? Say to the students, “Good work. What is the next step in this problem? Ready.” Signal. Say to the students, “Absolutely. What is thirty-three minus twelve? Ready.” Signal. Say to the students, “ Have we done all of the steps? Ready.” Signal. Say to the students, “Remember. You work the problem from the left to the right. What do you do first? Ready. Signal. Say to the students, “Good work. What is 16 divided by 4? Ready.” Signal. Say to the students, “Nice work. 16 ÷ 4 does equal 4. What do you do next? Ready.” Signal. Say to the students, “Yes indeed. What is 10 x 3?” Ready.” Signal. Say to the students, “You got it 10 x 3 equals 30. Say to the students, “What is the next step?” Ready.” Signal. Say to the students, “Did we finish all of the steps? Ready.” Signal. Say to the students, “Right again. There are exponents in this problem. What is the exponent in this problem? Ready. Signal. Say to the students, “Let’s work this part of the problem. What is seven squared? Ready.” Signal. Check your formula. What do we look for next? Ready.” Signal. Say to the students, “Remember. You work the problem from the left to the right. What do you do next. Ready. Signal. Say to the students, “Good work. What is 12 divided by 3? Ready.” Signal. Say to the students, “Nice work. 12 ÷ 3 does equal 4. What do you do next? Ready.” Signal. Say to the students, What is the next step? Ready.” Signal. Say to the students, “Correct again. Did we finish all of the steps? Say to the students, “Have we done all of the steps. Ready.” Signal. Say to the students, “So what is 100 – 7² + 12 ÷ 3? Ready.” Signal. Say to the students, “This problem is more difficult. Let’s see if you can solve this one. Read this problem. Ready.” Signal. Say to the students, “Right. There are brackets. What numbers are in the brackets. Ready.” Signal. Say to the students, “Right. First we work with the numbers inside the bracket. What is five minus two? Ready.” Signal. number outside the bracket by the number inside the bracket. What number is outside the brackets. Ready.” Signal. Say to the students, “ How much is two times three? Ready.” Signal. Say to the students, “That’s correct. How many times does twelve divide into thirty-six? Ready.” Signal. Say to the students, “Read this problem. Ready.” Signal. Say to the students, “Right. There are brackets. What do we look for next? Ready. Signal. Say to the students, “What numbers do we multiply? Ready.” Signal. Say to the students, “What do we do next in this problem? Ready.” Signal. Say to the students, “Let’s work this part of the problem. What is six cubed? Ready.” Signal. Say to the students, “Remember. You work the problem from the left to the right. What do you do next? Ready. Signal. Say to the students, “Good work. What is 90 divided by 10? Ready.” Signal. Say to the students, “Nice work. 90 ÷ 10 does equal 9. What do you do next? Ready.” Signal. Say to the students, “So what is 6³ – 12 + 90 ÷ 10? Ready.” Signal. Say to the students, “Right. There are brackets. Let’s start with the brackets on the top part of the fraction. What are the numbers inside those brackets? Ready.” Signal. Say to the students, “Can you work this problem? Ready.” Signal. Say to the students, “Good using your rule. You worked the brackets first, but you cannot do the subtraction because you have to do the exponent first. The E in B.E.D.M.A.S. comes before the S, so you have to do the Exponent before you can do the Subtraction. So let’s work the exponent. How much is 8²? Ready.” Signal. Say to the students, “You got that right. What do you do next? Ready.” Signal. Say to the students, “Good job. What is sixty-four minus four? Ready.” Signal. What do we do next? Ready. Signal. Say to the students, “Can we work the problem the way it is written? Ready.” Signal. Say to the students, “How much is twelve divided by two? Ready.” Signal. Say to the students, “That’s correct. How much is six plus four? Ready. Signal. Say to the students, “Good. What do we do next? Say to the students, “So what does 8² – 4 equal? Say to the students, “Nice work. That was a hard problem. Now you are going to work the problems on the worksheet exercise. Remember to follow your formula to get each step done correctly. A printable pdf version of the lesson including all worksheets is available for download. Click here to download the Teaching Order of Operations Complete Lesson pdf.